Well friends, April is upon us bringing its showers to bring May flowers and all that jazz... My house is now in complete and utter shambles as we are packing everything up and moving it to the BC coast in a few short weeks. However, I can't help but start getting excited for my 2011 garden (in Zone 8 no less! Eeep - just think of all the cool plants we will be able to grow!!!). I've been scouring around online for some ideas and inspiration (while taking a break from packing boxes) and I found some really cool ideas. I love having a kitchen garden right near the back door so I can pop out quickly while I'm making dinner and grab whatever I need for the meal - it's so great! 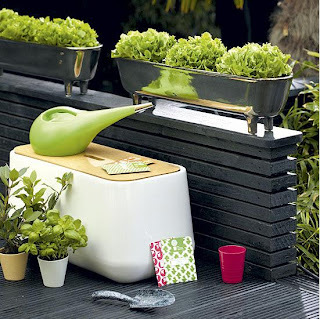 And how easy would that mini herb garden be as a DIY project?!?!? You could easily make the wooden frame from some scrap wood or look around at a thrift shop for something already made. These pots from Ikea would be perfect to mount onto the wood with a couple of nails (just remember to punch some holes in the bottom with a nail for drainage). 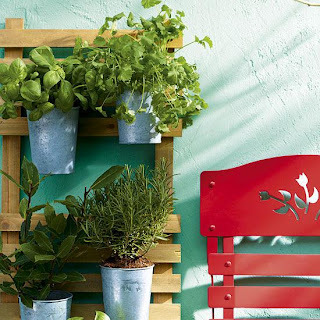 I want to make something like this to have on the deck to make better use of space by creating a bit of a "living wall". My birthday is coming up at the end of the month, and my father-in-law said he would build me a sewing centre cabinet for a gift. I just need to come up with a design. Hopefully I can find some ideas online (while taking a break from packing, of course!) because that would be absolutely amazing. Our new place is much bigger than our current one, so I am looking forward to having my very own sewing room in addition to actual storage so we can stow our camping gear somewhere other than a pile in a corner of the living room. Very exciting stuff! Well that's all for now. I am nearly finished both of C's dresses so I hope to post some photos of that later this week. Hope you all had a fabulous weekend!